camels, goats, cattle and me!! Watch out ahead!! This is in Brunei and just a reminder of what you can and can't do on the beach. Riding over the Pyrenees from France to Spain, this road was getting narrower and narrower and I thought I might be on the wrong road and I was loosing faith in my GPS. A few tunnels later I'm up in the ski resort area, still lots of snow and the associated hazards. I guarantee every five kilometres from Calais to Malaga was one of these signs. For the whole 2000km I only saw one deer, way off in a field, not the least interested in crossing the road. I did however come across many tractors, some towing farm machinery or trailers of produce. I loved seeing this as its one of the reasons my Home is in Sulphur Creek. We get tractors going down the Main Street. Cars, trucks, animals, motorbikes, we all shared the road and even without apparent order on the road we all felt safe and the traffic flowed without hassle. Mercedes taxi drivers were probably the greatest hazard. This one is outside 'my' restaurant. High up on the Atlas Mountains I came across this Berber family herding their sheep. We gave the woman a bag of all our spare toiletries from the hotels. She was very shy but you tell she was thrilled. These three wheelers are very popular. Not too sure if this fellow is going to market to sell his feed or going home to keep for his own use. Market day in Marrakech. Busy, noisy, fun. No vehicles allowed in this area, for obvious reasons. These goats have been trained to climb the argan trees. Herders collect a donation from passing motorcyclists wanting a photo!! Market day in a small village. the fellow in the centre is wearing traditional Berber dress. Wooden plank bridge. Quite sound, just very noisy as I crossed it. This young fellow was in charge of his donkey. Most animals are generally carrying something, animal, vegetable or mineral. Most adults are also carrying things. It seems Morocco is on the move, everyone and everything is carrying something. This caution ahead sign was in Gibraltar, in the National Park. Other signs showed butterflies, monkeys and blue wrens. Country road in southern Spain. 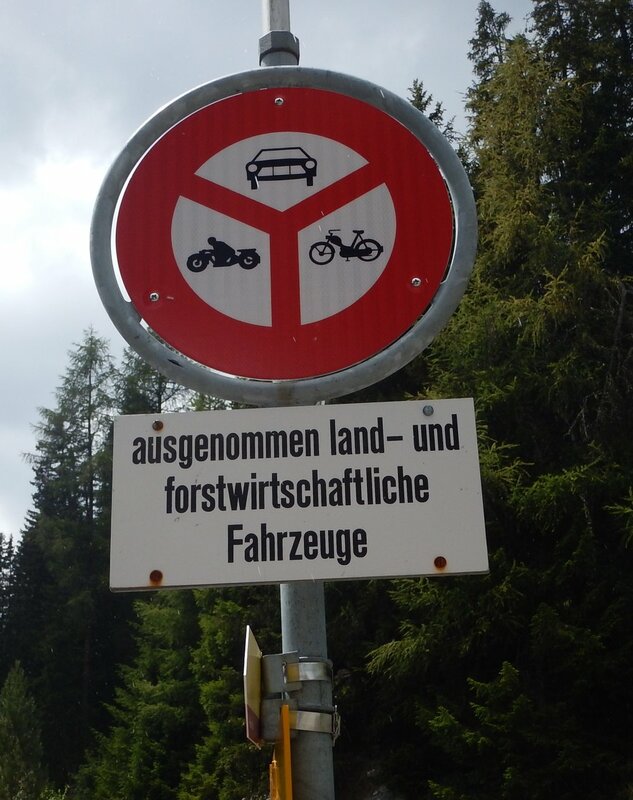 The Swiss being economical, one sign instead of three. No cars, bikes or bicycles past this point. cattle, thankfully this time contained by an electric fence. Gridlock formed by big yacht!! Italian drivers forming a queue to get on the ferry.